You cannot buy happiness but you can buy ladies designer clutches and that’s the same thing. Getnatty has the perfect option to satisfy all your women’s designer wallets craving. An array of stylish and modern designer ladies wallets are available at GetNatty. Each ladies designer clutches is unique and innovative in its own way. Knowing every woman’s need, GetNatty has variety of best designer wallets for women to make enough space for her essentials and favourites. Womens designer clutches play a vital role in a woman’s life, considering that she carries the designer ladies wallets to various occasions, events, work and simply everywhere. At GetNatty, one will find ample options of women’s designer wallets, potlis, clutches, totes, slings and more. All the best designer wallets for women are crafted with utmost love to suit every moment of your life. GetNatty has myriad of designer ladies wallets, clutches, potlis that you will have a crush on instantly. They are handcrafted with sheer perfection and unequaled detail. 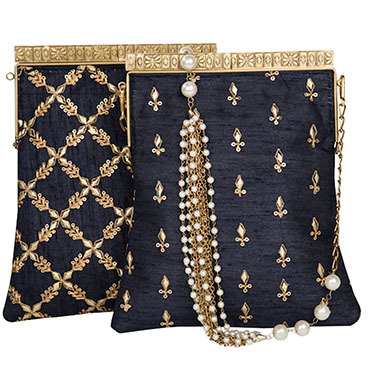 These womens designer clutches are also to-go bags of many renowned celebrities. We understand how hard it is being a stylish woman when you have so many precious little things to tote but need to keep up with your look. Handbags can be too big, slings can be little childish, and a wallet is just not roomy and comfortable. So how to keep up with fashion and ease? You glamourise your look with a womens designer clutch of course! Ladies designer clutches made their place in the fashion dictionary around 1920s when women could no longer have roomy pockets in their bodycon, silky outfits. So, all the little precious things found their road to a clutch spacious enough to carry them, but small enough to go with the fashionable looks. Since then, designer clutches have been the favourite fashion piece to make trendy statements around the globe. Womens designer clutches come in various styles and shapes. Sometimes they look like mini carry bags while other times they are like huge wallets, and yet other times they come in unique, uncommon designs. WALLET- YOUR TOGETHER FOREVER BAG! Whatever you are obsessing on, make sure to treat yourself with women’s designer wallets this season. They definitely are workable yet stylish and remain classic no matter what season it is. Make gorgeous designer ladies wallets all yours with just a click at GetNatty. There are plethora of options available at GetNatty when it comes to women’s designer wallets. Designer ladies wallets are available in different materials, embroidery, colours, embellishments and textures. You will find your perfect pair, whether you are looking for a classic piece or a trendy one.